DUE TO WEATHER CONDITIONS, VISITATION FOR GENE HAS BEEN CHANGED AND WILL BE HELD FROM 2-4:30 TODAY. Eugene ‘Gene’ Geiger, age 92 of Spring Valley, died Wednesday, January 30, 2019 at Spring Valley Health and Rehabilitation Center. Visitation will be on Thursday, February 7, 2019 from 4-7 p.m. at Keehr Funeral Home, Spring Valley. Funeral service will be on Friday, February 8 at 11 a.m. at Gilman Lutheran Church, Spring Valley. Burial will be at a later date in Gilman Lutheran Cemetery, Spring Valley. Gene was born October 26, 1926 in Spring Lake Township, Pierce County to Robert and Marthine (Bjornstad) Geiger. He was baptized and confirmed and a lifelong member of Gilman Lutheran Church, Spring Valley. Gene attended Spring Valley Schools and graduated with the Class of ‘44. On September 5, 1948 Gene married Audrey Russell at Trinity Lutheran Church in Glenwood City. They farmed in Cady Township where they raised their 5 children. They owned and operated Geiger’s Grocery Store Spring Valley from 1967 until 1988. Gene worked briefly on the pipeline going through his land and also worked on the Spring Valley Dam (1965-1967); worked for Madson Lumber Mill (1945-1955); and worked for Genesis Company for 16 years (1999-2016) and stated that he “doesn’t plan to retire.” He enjoyed playing pool at the Spring Valley and Ellsworth Senior Centers. Gene enjoyed many meals at Sneaker’s Pub and visiting with others. He made many visits to the Spring Valley Health and Rehabilitation Center and Park View Home in Woodville. 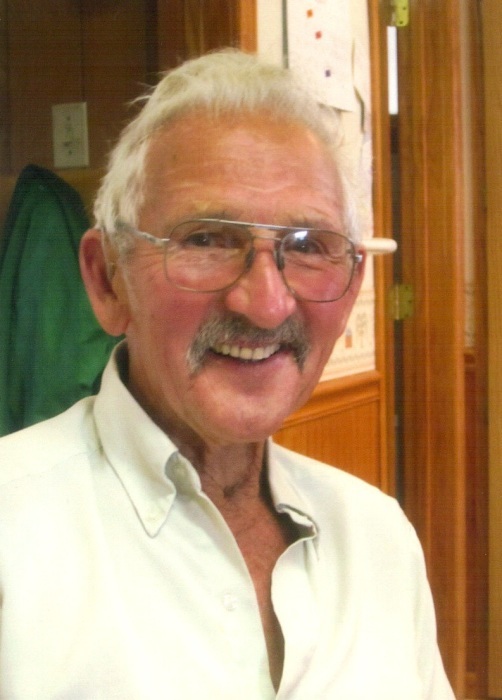 He played on the Gilman Mines Softball team on Sundays for many years; loved his tractor collection and participating in ‘tractor-cades’; and loved showing his collection to anyone who asked. He built 3 sheds with some assistance from others, the last shed at age 83. While working all the other jobs, he also farmed for many years until he sold the cows in 1998. He continued farming the land, selling hay to many, up until his death. He played the French Horn with Mckernon’s Band and the Chippewa Valley Symphony. His favorite music was Strauss waltzes. He was preceded in death by his parents; wife Audrey; son Robert “Bob”; son-in-law Bill Hinzman; sisters-in-law: Georgia “Jo” Hagen, Margaret Johnson; brothers-in-law: George “Steen” Russell, Bryce Russell, Kenneth Matter, Charles Johnson, Arthur Jersild and Gene Hagen; granddaughter Kim Hinzman; and nephew Alan Jersild. He is survived by daughters: Linda (Wayne) Miklian of River Falls; Chris (Randy) Jensen of Spring Valley; Sandy Bock of St Joseph, MN; and son Gary of Spring Valley; daughters-in-law Donna Abd El Malak (Amir) of Stillwater, and Marlene Backhaus of Menomonie; grandchildren: Josephine Geiger of St Paul; Nicholas Geiger Stillwater; Jason (Ashild Falch) Miklian of Norway; Jessica (Erik) Olson of River Falls; 2nd Lt. Mark Hinzman of Qatar/UAE; Jessica (Eric) Stark of Baldwin; Mary Jensen (Matt) of Hersey; great grandchildren: Emma Abbott (fiancé Michael Braun) , Orion and Elliot Miklian Falch, Gabe and Madelyn Olson, Amanda (Ben Struve) Leach, Danielle, and Katie Leach; Mya, Drew, and Jordyn Stark; Dylan, Kaylee, and Briley Eggen; sister Bertha ‘Betty’ Jersild of Milwaukee; sisters-in-law: Barbara Matter of New Richmond; Ann Russell of Rockford, IL; and Charlene Russell of Garrison, MN; many other relatives and friends. Visitation is Thursday, February 7, 2019 from 4-7 p.m. at Keehr Funeral Home, Spring Valley and one hour prior to the service at church on Friday. Funeral service is Friday, February 8, 2019 at 11:00 a.m. at Gilman Lutheran Church, Spring Valley. Burial will be at a later date in Gilman Lutheran Cemetery. Pallbearers are: Wayne Matter, Jeff Matter, Brad Matter, Brian Matter, Myron Stark and Eric Duhnke.